*Tons* of broccoli this week, and at a great price. If you’re a broccoli fan, this is your week. The broccoli is beautiful, but the cauliflower is a little ugly. Happily, the price will reflect it. If you like cauliflower in ways that don’t depend on its aesthetic appeal, this may be your week. As of this writing, North Mountain Pastures still has some turkeys available for pre-order. They may not last much longer! This week’s Staff Pick: Provola, selected by Julia. I’ve been talking for what feels like ages about making buffalo celeriac. I love buffalo wings. I love celery with my buffalo wings (and blue cheese). I became obsessed. Dusty’s the fry-master in our house, and usually has a better handle than I on what techniques will work when experimenting with new things, so I just had to wait for an evening when we both had a little bit of experimentation time. Last night it happened! I’d pictured cutting the celeriac into something like sticks the size of a mozzarella stick, then lightly breading, frying, and tossing with sauce the way we would buffalo wings. The fry-master thought we’d lose the breading in the toss, and they’d probably be a little trickier to fry in smaller pieces, so, using a Joshua McFadden recipe for a very different kind of fried celeriac steak as a little bit of a guide, we cut the peeled celery roots into thick-ish slabs and par-roasted them for about 15 minutes. And then proceeded with the breading and frying. After they were out and a little bit of the oil blotted off, Dusty topped them with our favorite wing sauce combo — Torchbearer’s Buffalo Wing Sauce plus Frank’s Red Hot (usually we add melted butter, but the breading on the celeriac seemed like it held plenty of oil without it!). A dollop of a thick blue cheese dressing (with our Oasis Blue Cheese and Sour Cream, of course) on top, and voila. My dreams come true! While wings might be a full meal, we weren’t convinced that doing the same with a veggie would be satisfying, though, so we had to find something to go with them. 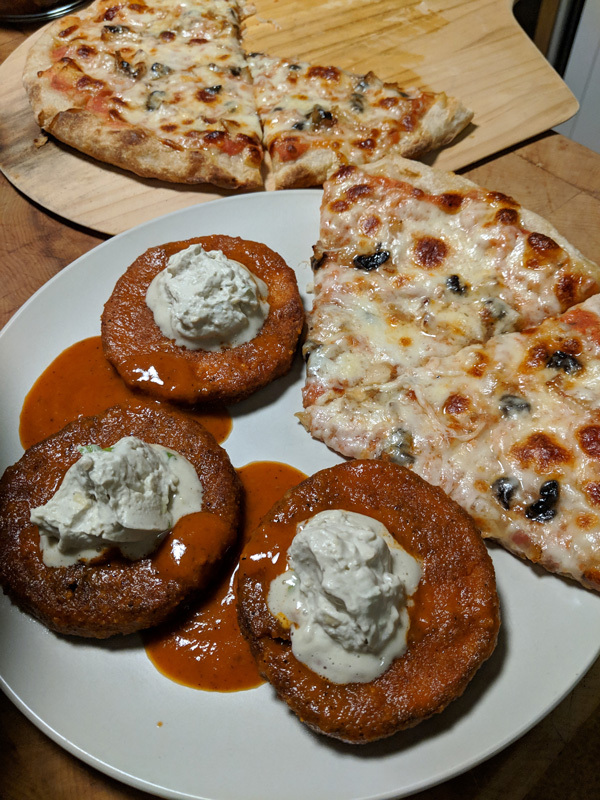 We were kind of stumped, because usually we want celery and blue cheese with anything buffalo, but….seemed like we had that covered. Sometimes we make a blue cheese coleslaw to go with wings, but….that didn’t seem like it would really make it a meal. What else do people eat with wings? Pizza, of course! Truthfully, pizza and wings together is not a thing we usually do. Just seems…a little heavy? But I’m always looking for an excuse to eat pizza, and this seemed like a good one, so we grabbed a McGrath’s crust and some CapoMozz (and tomatoes we canned over the summer) and made it happen. I would do it again. As I often am, when I looked at my plate I was tickled at what an unusual (and yet oh-so-familiar) meal we’d made almost entirely from local ingredients. Even the bread crumbs were from a bygone stale baguette we’d put in the blender after it achieved rock-hard status! And even our pizza toppings, picked up in Philly the last time were there, were Pennsylvania-made. Who said eating local had to be healthy? Speaking of indulgences, I can’t let a November week go by without thinking about Thanksgiving. This morning’s Splendid Table email showcased a recipe for Farro with Vinegar-Glazed Sweet Potato and Apple, which seems just based on the recipe like it could become one of my favorite things ever. I might skip the fennel if we don’t have any (or sub in celeriac??? ), maybe explore using some cherries we froze over the summer instead of dried (maybe oven dry them? ), maybe even use the Keepwell Sorghum Molasses vinegar instead of sherry vinegar (tho’ I sure do love sherry vinegar, too). Royer Mountain or Oldwick Shepherd instead of pecorino, and all I’ve gotta find elsewhere are some cashews and olive oil (oh wait, those are in my pantry already!). I think odds are high this one’ll make an appearance on my Thanksgiving table. Or maybe the next day, with a pile of leftover turkey on top? P.S. If you use the Small Valley Milling Emmer/Farro we carry to make the recipe above, you’ll almost certainly need to cook it longer than the recipe calls for. There are a lot of different kinds of cheeses out there, but to some extent I lump them all into two categories — cheeses I can eat unlimited amounts of, and cheeses I can’t. Most really good cheeses fall into the “can’t” category — they’re too sharp or pungent, and even though I love the flavor, I find myself practicing a natural moderation. Dusty, for what it’s worth, does not have this issue — he believes, the stronger and sharper and funkier the better. He’ll eat unlimited amounts of anything. On the flip side, many of the cheeses I can eat unlimited amounts of are a little boring. Think about your colbys, your mild cheddars, even your monterey jacks. Don’t get me wrong — I can and will eat unlimited amounts of these cheeses, they just rarely have flavor of a depth that knocks my socks off. Caputo Brothers Provola has become one of my standbys because I can (and do) eat unlimited quantities of it, but I never, ever find it boring. The Provola starts life looking a whole lot like the CapoMozz we featured back while tomatoes were still in season (sniff). The curd is stretched (but this time at the creamery), brined, and aged, until the “aging process removes excess moisture, resulting in a smooth, firm consistency and a sharp, tangy flavor.” (So says Caputo Brothers.) I would actually argue with them on the last part, though — it’s not really all that sharp. Just a little sharp. Just a little tangy. But with a really nice underlying depth that I imagine is because the cheese is cultured (rather than acidified), the way the CapoMozz is, and the way traditional Italian cheeses are. Before we started carrying Provola ourselves, I was ordering a half pound of it a week through another supplier we work with. Every week. Like clockwork. Finally I thought, this is crazy, if I rely on this cheese so much, shouldn’t we figure out how to carry it? So we did. It wasn’t hard. I don’t eat a half pound of it every single week anymore, but it remains a staple. I love it on regular sandwiches, and on grilled cheese. In the winter I love to make a Mississippi Roast in the Instant Pot and then make sandwiches — topped with provola — with the shredded leftovers. I’ve put it in mac & cheese. And I’ve eaten a whole lot of it alongside apple slices with peanut butter. You may think this is weird, but don’t knock it till you’ve tried it.